The future is here, but director Robert Lee Zemeckis (Back to the Future trilogy, Forest Gump, Flight) himself probably never predicted back then that he would win the Oscars and make one of the scariest non-horror movies ever. And its tone isn’t even too serious. 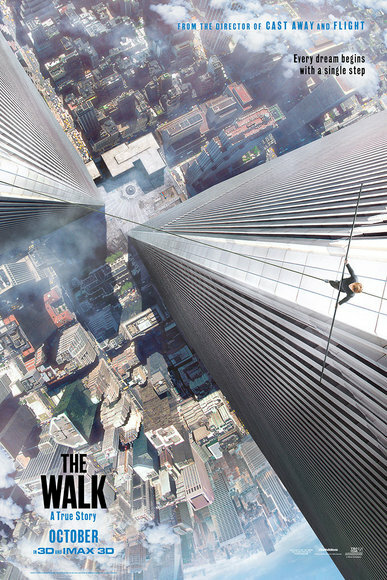 Based on a crazy and yet amazingly inspiring true story, The Walk is about one man’s dream on walking a tightrope between the rooftop of the late World Trade Center (1973 – 2001) in New York, which were once the tallest buildings on Earth standing over 1,362 feet, and not that near to each other. 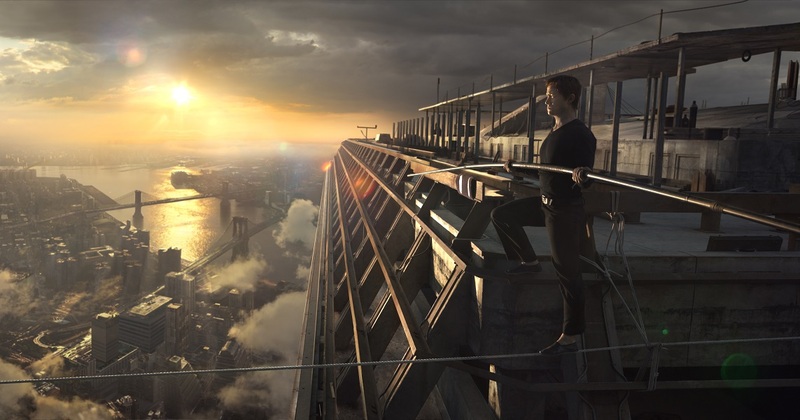 Set in 1973, the narrative and focus is completely on French street performer Philippe Petit, portrayed by Joseph Gordon-Levitt (Sin City: A Dame to Kill For, 500 Days of Summers), as he retells his life story from his childhood and builds up to the terrifying finale where he attempts to achieve his dream. I’m not sure if anything was done to Gordon-Levitt’s face like in Looper (2012) but it sure looks weird. Perhaps it’s to make him look for French or foreign. His performance is great with the convincing fake French accent and his usual likable charm. But what’s more impressive is that he actually really had to walk on hanging ropes while acting. Who would’ve thought he could do more than just drama, riding bicycles (Premium Rush) and flashy fight scenes (Inception). 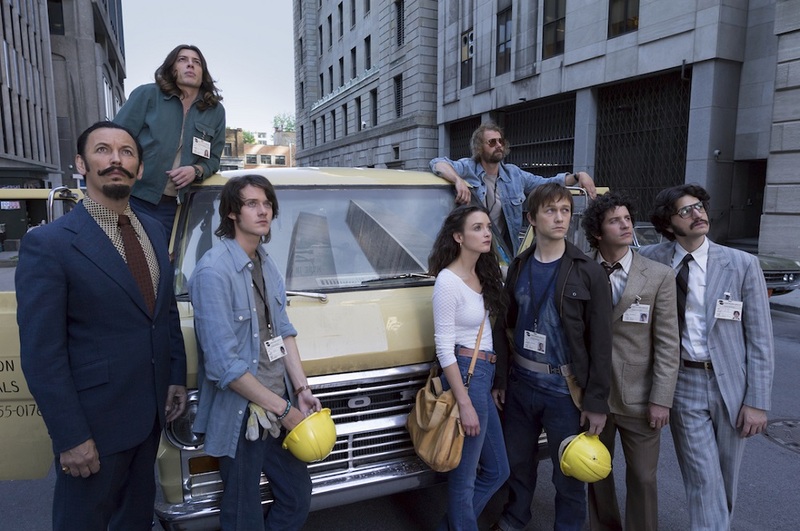 Written by Zemeckis and debutant Christopher Browne, the tone and dialogues are a bit cheesy, and as a biography, it certainly doesn’t try to reach the same level of heaviness as the likes of Aviator (2004), Raging Bull (1980), A Beautiful Mind (2001), just to name a few. However, the film’s climatic scene that it builds up for is far more satisfying that I was expecting. As I am afraid of heights myself, watching that long scene of Petit walking on the rope between the twin towers was extremely terrifying, even more so than Gravity (2013) as it is more relatable than being in space. 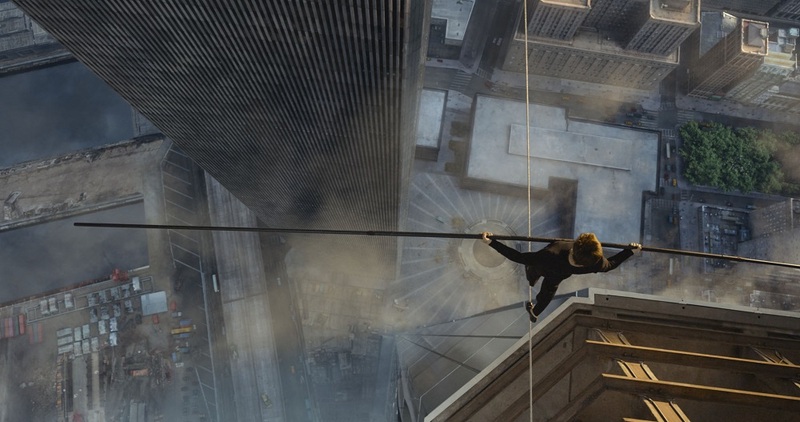 With the help of cinematography by Dariusz Wolski and CGI, Zemeckis pulled off the most technical high-wire walking scenes in film history with plenty of wide shots of all angles. It’s so immersive, my palms were sweaty (mum’s spaghetti) while watching it and I was screaming to the screen, stop it already! Yes, if you know the facts, Petit indeed did not just walk from the top of one tower to the other. Also, he did not just ‘walk’. It may seem like a nutcase to plan an illegal coup like a heist job for one ultimate (seemingly suicidal) objective. This is where it’s fun and humourous with Petit’s team of accomplices involved. One of them are even afraid of heights. The lack of development and background of these characters just show what an eccentric, selfish, glory-hunting Petit may be as it is him who’s retelling the story to the audience. He doesn’t even return the same manner of support to his then-girlfriend Annie Anix (Charlotte Le Bon). But it does convey how one’s crazy, self-centred, profitless dream can be a world so beautiful and meaningful that very few could understand and feel. A dream so high that no human could touch. And once that dream comes true, it becomes something movingly inspiring, that “nothing is impossible”. The subtle proud but sad expression by Gordon-Levitt at the end is a brilliant, delicate tribute to the tragically destroyed World Trade Center. Malaysia censorship: Vulgarities are muted and a quite important sequence with naked Gordon-Levitt is cut. To watch in 3D? The depth of three dimensions is quite significant for certain objects but regardless, watching it in IMAX was truly a immersive. My palms were sweating and I was terrified as though I was in the movie itself. Second opinion: My girlfriend also felt that it was fun and the 3D experience is good. Verdict: Screw Halloween flicks in October and watch this instead.